It's time for Die Cuttin' Divas Challenge #102. I made these little 3x3 Valentine cards. I used Hello Kitty Greetings cart for HK, I Love You, and the heart. All paper was from my scraps. The scalloped mat was cut from Elegant Edges. The sponsor for this challenge is Purple Cows. They are donating a Trim It 9 Blade Trimmer. A winner will be randomly chosen from the entries received for this challenge and next week's challenge. Here's a few close-ups of my cards. We hope you'll join us for the COLOR Challenge this week at DCD, and enter your card, layout, or altered project using a die cut image. 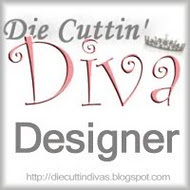 You'll have one week to enter at the Die Cuttin' Divas blog. Please remember to include which die cut you used and a link back to your post. We look forward to seeing what you create! Thanks so much for stopping by. Sweet, sweet cards - perfect for Valentine's Day! And, even better that you were able to use up some scraps! These are totally adorable! These are so sweet Pat. I love that they are so tiny and cute and you can't go wrong with HK. Hi Pat, wow your mini cards are super cute!! These little cards are soo adorable!!! I just love theme!! These came out great. thanks for playing at CardzTV. Great cards and thanks for entering at Exploring Cricut. Oh my goodness Pat...all your cards are just adorable! I love your Hello Kitty card..she makes me smile! Wow-- these lil' cards are amazing and just adorable. Who would love getting one of these sweet cards for valentine's day. So excited to be on the DCD DT with you. Hello Pat:) very cute cards:) Thank you for stopping by today! have a great evening!! They are all SUPER DUPER CUTE!! DCD's Tic Tac Toe Challenge!